Today I took note of the plan for Moscow Metro in 2020 (external link: m24.ru/infographics/3428; M24 is for москва24, a broadcaster). In Russian words my response was: вот ето да, maybe something like OMG, or so. 64 new metro stations will be constructed in the 2015-2020 period; and 14 additional new ones have been finished between 2011 and 2015. Most interesting to me was that they intend to build an additional circle line which parallels the Moscow Automobile Ring Road (МКАД). MKAD once used to coincide with the administrative boundaries of the capital, but Moscow grew beyond in recent years (mainly due to an acquisition of municipalities in the South West in 2012). Anyways, it will take you about 100 kilometers to circle Moscow on the ten-lane MKAD. And the new circle line will probably have a similar radius of some 16km. The existing circle line (each line has its color; the circle line is the brown one) is rather important within the capital’s transportation infrastructure, because all other lines together are organized like a spider web. Everything is concentrated towards the center. It is easy to get from the outer parts to the inner city. But travelling from one tail, e.g. in the South-West, to another in the South is not. The existing circle line fills this gap below the ground. Above the surface, the spider-web is complemented by public buses and trams. The existing circle line has another major advantage compared to most other lines: Air-conditioned railcars. And this is something you will adore both in summer and winter times. Most of the newly planned metro stations will be located outside of MKAD. Note that the first metro station beyond MKAD was opened only in 2002. Beside the new circle line the already existing yellow line will be heavily extended towards the west and south-west of Moscow. The light green line will also see nine new stations in the north. Two major questions arise, the first being how to manage the underlying procurement process, and the second being what spatial economic spillover effects will result from this investment in public transportation infrastructure. Thirdly I am looking forward to new inspiring public architecture. 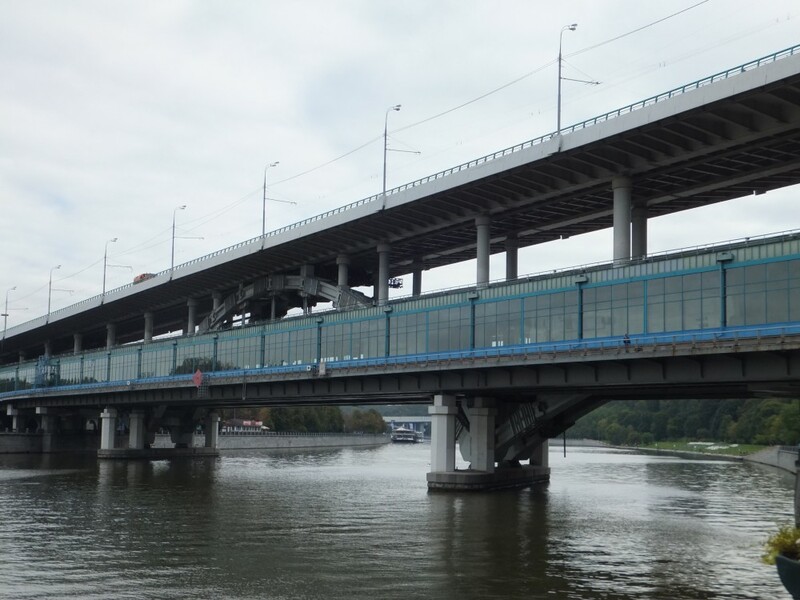 One of my pet stations is still Vorobyovy Gory (pictured, while the train halts, you can enjoy a beautiful view over Moscow river), but this means almost nothing in a city where each metro station is a marvelous location.